Christmas is about making things magical and special for the kiddies isn’t it? It isn’t about the price of presents, or the size of the turkey. Apparently the current generation of parents are determined to keep their little elves children believing in Santa. The NSPCC surveyed 2000ish parents, and the findings of this are below. Personally I think I’ve lost the “believe I Santa” thing with my boys, D hasn’t believed for years, and this year Jen tells me he doesn’t want “any silly gifts from Santa – I know that’s just YOU writing in your wrong hand!” Even if I have lost this fight, I intend to keep trying a bit longer, just in case. They will get a letter from Santa, we will feed the reindeers and we check out NORAD Santa radar together a few times on Christmas eve. The nation’s favourite family Christmas tradition for parents is leaving food and drink out on Christmas Eve for Santa and his reindeer to enjoy. The NSPCC survey also revealed that we’re a nation on the naughty list with almost a third of British parents opening a present on Christmas Eve with their children. 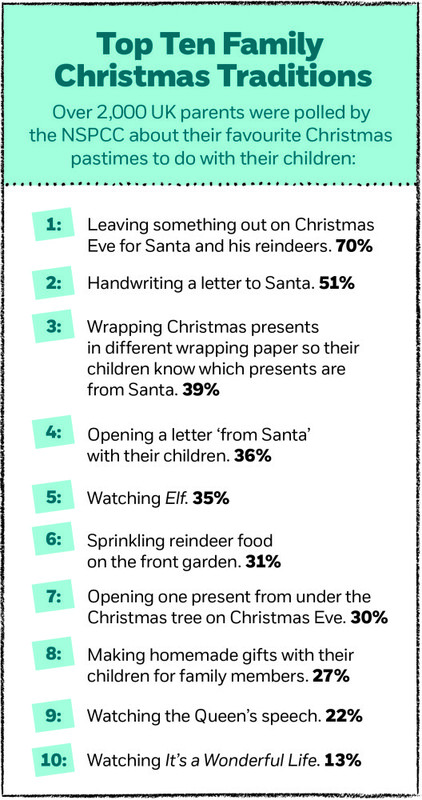 But perhaps most surprisingly, even in today’s digital age, over half of parents encourage children to hand-write a letter to Santa. Family Christmas traditions are increasing in popularity across the nation as more and more parents embrace the magic of Santa, much more elaborately than their own parents once did. Proving to be an oldie and a goodie, sitting down to watch ‘It’s a Wonderful Life’ has increased in popularity over the years as new-fangled HD technology is shunned for a more simple pleasure of enjoying a black and white flick. NSPCC supporter and Psychologist, Dr. Linda Papadopoulos, commented on the results: “Family traditions are an important part of childhood, giving children a sense of their past as well as a sense of what they can look forward to in the future. At Christmas time, whether it’s hand-writing a letter to Santa at the kitchen table, making mince pies or opening a letter from Santa, personalised traditions can be a great way to bring the family together. From asking parents about their own childhood, it seems that Christmas has also become craftier in recent times with parents making more of an effort (27%) creating homemade gifts with their children as opposed to 18% in times gone by, proving that it is the thought that counts. Request your Letter from Santa for a suggested donation of £5 to the NSPCC at www.nspcc.org.uk/santa or by calling 0845 839 9304 until 15 December So get in quick. Sarah Bailey recently wrote… Acorelle – Intense Cherry Gift Set: Review. 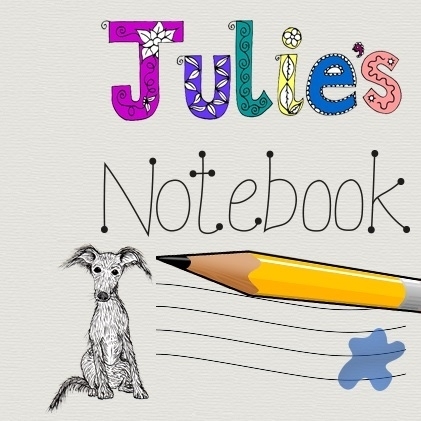 There is a letter for grown ups! I still open a ‘stocking from Santa’ and I’m… a little older than your boys! !